Built-in dual-display multi-viewer lets you display up to 20 different images on two monitors; up to 16 on one screen. Four independent AUX busses, with mix transitions to AUX 1, also offers a clean feed with layer selection for IMAG, Webcasts and other applications 16 HD/SD-SDI inputs standard. 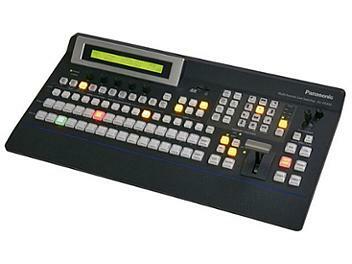 HD/SD format depends on switcher system setting. Two DVI-D outputs standard (scalable to 1920 x 1200) for display of MultiViewers (or other outputs) with large flat panel monitors or projectors. One upstream and two downstream keyers, super-clean chroma keyer employing Primatte algorithms. Ten shot memories and 10 PinP memories with timed transitions, for streamlined operation. Six User programmable function buttons for customized workflow. Four Frame Memories for rapid access to stills and graphics. Expanded control of up to five Panasonic pan/tilt/zoom camera (with source/control switching) when used with AW-series controller, storage and recall of ten presets per camera.